ILGTI is a loose collaboration of many Indian lattice gauge theorists who share resources and work. We are open to new members joining the collaboration. If you have a regular faculty position anywhere in India and would like to join the ILGTI, please contact us. 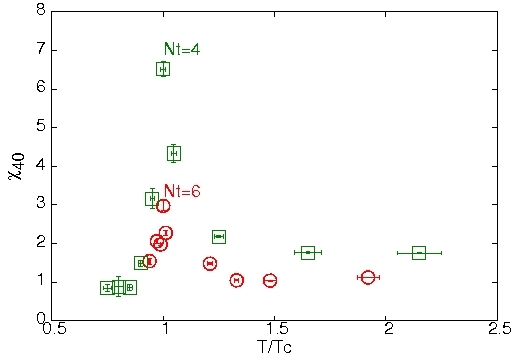 The fourth order quark number susceptibility χ40 peaks close to Tc. This is closely related to the "Kurtosis" signal for the critical end point. The fourth (and higher) order susceptibilities were first introduced by us in 2003. We could certainly do with your help: whether you are a reasearch scientist, or a student. If you are a teacher and you would like to talk to us, we welcome contact. See our page on jobs, projects and contact for more details.